The MyPhoneExplorer Settings dialogue. Don't be scared. When I told you about MyPhoneExplorer, the software that does for free what Samsung and other Android phone makers seem incapable of doing for money, I mentioned that there were helpful, comprehensive instructions. I did not, however, tell you where to find them… Here they are. There’s also a forum where you can ask any questions you might have. Don’t be put off by the fact that it’s in German, it’s an easy language to pick up. Oh OK, the English section is here. What follows are a few things I discovered for myself that may help you set it up right. It’s worth noting first that there are two parts to the software – a desktop application for Windows, and a phone app available from Google Play. Don’t bother downloading the latter though. On first using the desktop version, go the the Settings dialogue in the File menu and tell it that your phone is an Android and that you connect by USB (or set it to Autodetect the connection). Then when you plug the phone in it will install the Android app itself. All I wanted to do was back up my photos and other files, without having to remember. Backups that need to be remembered are backups that don’t get done. Not when I’m in charge. MyPhoneExplorer can sync over Wi-Fi and Bluetooth, but as I often recharge my phone by plugging it into a PC I thought the most dependable way would be to do it automatically whenever the USB cable connects. For this to happen of course, the program must be running on the computer. So I searched through the menus trying to find the checkbox that would make it launch on startup. And searched, and searched. To save you some considerable time, there isn’t one. You have to do it the old-fashioned way by creating a shortcut in the Startup folder. (Find the MyPhoneExplorer folder in the All Programs menu, click and hold the program icon and drag it to the Startup folder.) You know it’s freeware when the author finds the simple way just too boring. There are other options for you to play with. Many, many other options. For example, you can choose whether to sync your contacts with Outlook or some other program. Under the menu item “Advanced 2” you can select the folder where your photos will be copied, so if you’ve already set up Kies to put them in a certain location you may as well use the same one again. Several copies of your pictures on different computers = Good management. Several copies on the same computer = Pointless (but pretty normal). 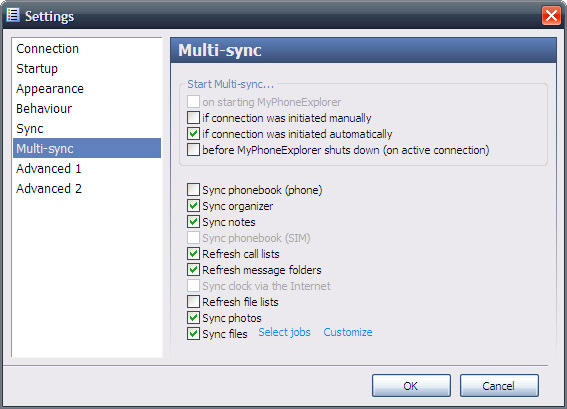 The crucial settings for syncing though are under the menu item “Multi-Sync” (see picture). A Multi-sync is what it calls a pre-set choice of items to sync all in one go. You can select exactly what you want to be copied, and where to. And while all the usual ones are available – photos, contacts, calendar and so on – the great thing for the power user is that you can create custom file syncs. For example, I copy across podcasts I’ve downloaded to the PC during the day. In the opposite direction, I have it transfer things I drew or wrote on the phone. The crucial one here though, if you want things to happen all by themselves, is “Start Multi-sync if connection is initiated automatically”. Once that is checked the program should detect when you’ve plugged the phone in and start to sync, making backing your phone up as easy as putting it on charge. If it doesn’t start, I dunno what you’ve done wrong. Try poking things randomly. I love your writing style – I’ll trawl the rest of your site over time.